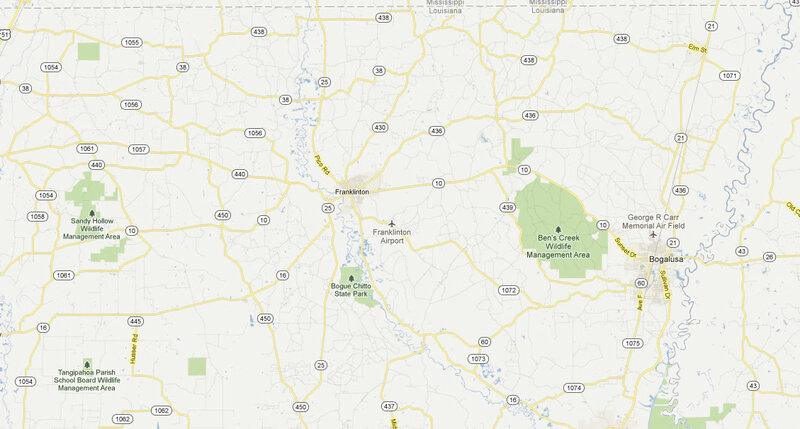 Washington Parish is one of several parishes known as the "Florida Parishes." The area was so named because it originally was part of “West Florida”. Although the Louisiana Purchase took place in 1803, West Florida was not included in the sale. After the 1810 Rebellion of West Florida, the United States was able to take control of the region. Louisiana became a state in 1812 and Washington Parish was formed in 1819. Early Washington Parish residents moved into the area from Virginia, Tennessee, Kentucky and the Carolinas, having been offered land grants for prior military service. Washington Parish patriots also fought with General Andrew Jackson in the Battle of New Orleans in 1814. Enroute to New Orleans, General Jackson marched his soldiers through Washington Parish on what is known as Military Road. The Town of Franklinton became the parish seat in 1821. Bogalusa, the only city in the parish, was founded in 1906 by the Goodyear family of Buffalo, New York, who established the Great Southern Lumber Company. In 1908, the world's largest yellow pine sawmill began operations and today continues to operate as an International Paper mill. In addition to its timber and paper industry, Washington Parish is known for its agriculture, particularly watermelons.